The Intercontinental Champ shares his hectic schedule and views on health and fitness. The adulation that WWE Superstars receive looks glamorous on the surface, but behind the curtain is a tale of discipline and self sacrifice made by every Superstar striving to be on top. Dean Ambrose is one of the most popular Superstars in WWE. At WrestleMania 33, on April 2nd, he will defend the Intercontinental Championship against it's number one contender, Baron Corbin. WWE is a serious business. Matches are available via the WWE streaming subscription network, and on mainstream television channels around the globe. Live events can also be witnessed via touring arena shows in numerous countries. The frequency of WWE events is so great that regular performers can easily rack up more than 200 matches per year... in just as many towns. "I go out there every night and just let it all hang out," says Dean. "It doesn't matter if my opponent is 7 feet tall or 400lbs. I put 100% effort in every time." The man they call the "Lunatic Fringe" has one of the most unorthodox styles on the mat, and this makes it difficult for opponents to scout for flaws. Dean's wild style has earned him million of fans. He shares, "I like to fly by the seat of my pants, and wing it, when I'm out there. I find it to be more exciting like that!" Few can question his commitment to the WWE lifestyle. 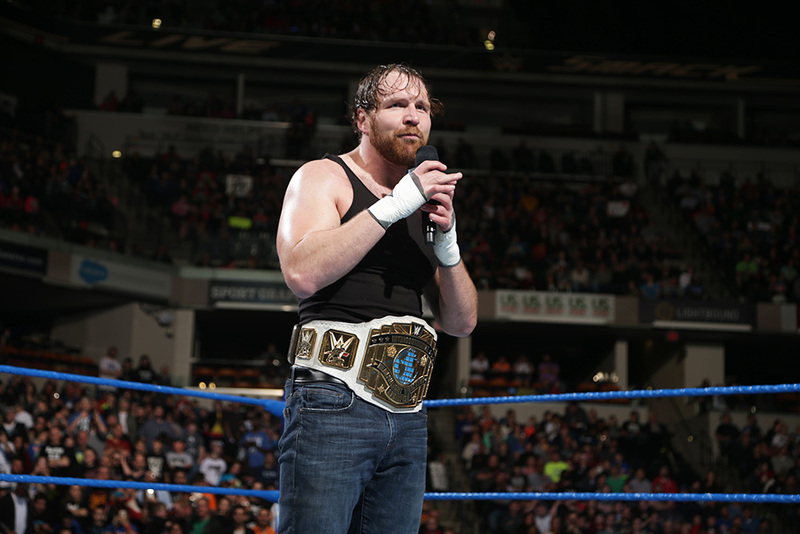 Dean recalls that he believes there was a 3 year stretch where he wrestled more matches than anyone else on the entire roster, all without picking up a serious injury along the way. So what does the popular WWE Superstar attribute to his stamina and longevity? "I was trained very well and I'm very good at taking care of myself," Ambrose admits. "I also do a ton of yoga, I like to stretch, and I like meditation. As I have gotten older I've taken the time to think more about mental and physical balance." The life of a WWE Superstar is a grueling one. In recent times Dean has been called on to do 'double duty', wrestling in two matches, in two cities, on the same night. How does any athlete cope with such a schedule while trying to stay in top form? "Several times I've been up first in one town, wrestled 20 minutes... and then got on a plane, and walked into the main event in a different building, in a different town that same night. We do 14 straight nights wrestling in Europe before we get on a plane for Saudi Arabia or England. You have to figure out your own rhythm, and make sure you get a good work out in when you are home because you never know when you will be able to (find a gym) on the road," says Dean. Often, the WWE Superstars make the best of a difficult situation on the road. No gym available? No problem! "Sometimes if there's no gym available, we get to the arena early and we run the stairs, or we find an area of the building to do some running," shares Dean. "The thing with working out, both for athletes and people in general, is that if you want to find the time to do it you will. It's a learning curve but you figure it out as you go along." With WrestleMania just days away, how does Dean feel about competing on the biggest night on the Sports Entertainment calendar? "WrestleMania is the time of year when there is that little bit more excitement in the air, and you feel it when you are heading to shows leading up to it. It's so big that it's hard to even put into context. The set is huge, and there are so many lights, and the ramp leading to the ring is so long. What WWE does to a football stadium to prepare it for WrestleMania is incredible, and there are so many people there that it's hard to wrap your head around it." This year Dean will defend his title against a relative newcomer in Baron Corbin, a former NFL offensive lineman. The Intercontinental Champion gave us his final assessment of what to look out for during WrestleMania 33 on April 2nd. "Baron is an up and coming star. He's starting to pickup some big wins so this is going to be a new challenge for me. It's going to be a test for him too, let's see what he brings to the table. I'm the guy with a little bit more experience, and I'm going to use that to my advantage," declares Dean. If Ambrose is successful at "The Show of Shows" in Orlando, there will be no let up for the rest of 2017. The WWE is all set to tour as far and wide as the United Kingdom this coming May, and Singapore in June. Fans clambering for tickets should have no fear that the "Lunatic Fringe" will be in fine form.